The audition dates will be posted every semester in the MDT calendar. includes two studies by any of the following composers: Matteo Carcassi, Fernando Sor, Mauro Giuliani, Leo Brouwer, Abel Carlevaro, and two contrasting solo pieces. Two solo pieces in any style and major and minor scales that demonstrate the level of achievement, will be accepted. A short program (½ hour) of works from three different historical periods (Renaissance, Classical, Romantic, Modern/Contemporary) with at least one multi-section work, sets of pieces by the same composer, and two studies by Heitor Villa-Lobos, demonstrating the advanced level that is expected. A fifty-minute weekly lesson with the assigned instructor. 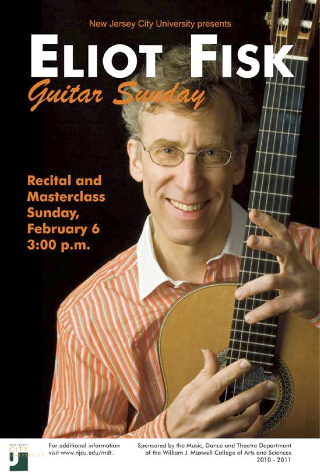 This course is designed to provide guitar majors with chamber music experience while playing works written or arranged for guitar ensemble. It also satisfies the small chamber ensemble requirement for music majors and is required of all undergraduate students enrolled as guitar majors throughout their studies at NJCU. The ensemble meets at least once a week under the supervision of the instructor and is expected to rehearse independently of this session in preparation for the regular Guitar Program performances at Music Major Seminar , the Guitars Galore events and for senior recitals. The students registered in chamber ensemble may be coached by their guitar instructor or by the instructor of any of the other participating students and it can substitute for Guitar Ensemble during the semester it is taken. The chamber ensemble must perform at Music Major Seminar, either at the one reserved for guitar or at the one for the other area(s). All the students must agree to participate in any recital that the partners may be presenting, at a mutually agreed on date/time. Extra rehearsal time outside of the coaching sessions is required for this class. Graduate Students must take one semester of chamber ensemble during their studies. This class is a survey of music written for the guitar and ensembles including the guitar exploring the historical perspectives, major composers and performers and important repertoire. This class substitutes the Guitar Methods requirement for Music Education majors whose instrument of study is the guitar, and is a requirement for Performance majors in guitar and recommended for all other guitar majors. A full length recital at the end of the program of study that should include major works from different time periods including a multi-movement work by J.S. Bach and a 20th century masterpiece. Two full length recitals with or without intermission, or at least one hour of solo music. The Junior Recital must occur within the 5th or 6th semester of Applied Music in College, and the Senior Recital towards the last year of Applied Music. The possibility of adding chamber ensemble and/or guitar ensemble performances in these recitals will depend on the amount of material to be presented. Each recital should comprise one or two major works in the repertoire, a multi-movement composition and represent through its contents different time periods (Renaissance, Classical, Romantic, Modern/Contemporary). A recital towards the eighth semester of Applied Music must consist of at least a half hour of solo music. Representative pieces from at least three time periods, and a major work from the concert or pedagogical literature (studies) must be included. This recital can be enhanced with the addition of guitar and/or chamber ensemble in which the student must perform a significant role, such as the lead guitar in the ensemble or a major part in the chamber combination. No recital required. If the student chooses to continue taking lessons past the required four semesters, a recital must be presented during the last (eighth) semester. This recital should consist of at least a half hour of solo music and can also be supplemented with the performance of the guitar ensemble and/or a chamber ensemble. 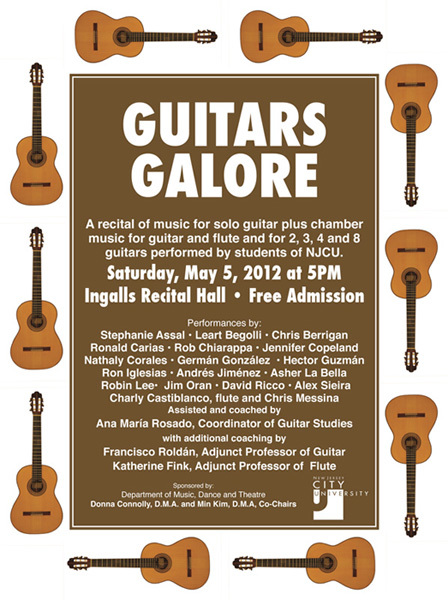 Guitar Sunday at NJCU: a recital and master class by top international performers. This activity is open to all; the audience and the students at NJCU first listen to world class performers and then attend a master class for selected students. This opportunity not only enriches the education all guitar students receive at the MDT, but also enhances the chosen performer’s credentials for further study and professional performing opportunities. Artists of the stature of Roland Dyens, Jorge Morel, Fábio Zanon, David Leisner, René Izquierdo, The Newman and Oltman Guitar Duo, Berta Rojas, Eliot Fisk, Benjamin Verdery, and Jason Vieaux have participated in the series. Guitars Galore; a twice-yearly recital (each semester) where all the guitar majors that are ready to perform memorized works can participate. The different formations of Guitar Ensemble and Chamber Ensembles are also featured on a Saturday afternoon recital that is open to all. 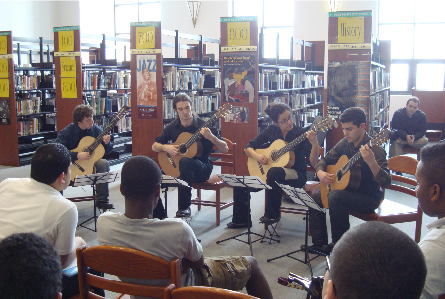 The guitar program regularly visits high schools in the area such as Arts High in Newark to perform in solo and ensemble setups and is occasionally featured in events such as the Guitar Night 2012 of the New Jersey Classical Guitar and Mandolin Society held at Trumpets Jazz Club in Montclair, N.J.